I really wanted to tell a story this time, a sad one. The kind where a young soldier-dad passes off a newborn baby to his new wife, just before boarding a plane in Las Vegas to go to Iraq at the height of the surge. I thought about how I would describe my friend’s tears. There would be a sentence about how he lifted his uniformed shoulder to hide his tears from the other soldiers in his unit waiting for the plane – where I was waiting. Somewhere in there I would mention how frail and rare a baby looks in those first days. Maybe there would be other sentences about how happy his face was when he got back to Baghdad after leave, with fresh pictures of his little cherub back in Southeast Michigan, who was waiting there for him when he got home. Some stories, however, are best left untold and anonymous when enough public service has already been paid. Instead, I will ask a question: Why doesn’t the Michigan Legislature understand the importance of military families? Every election season both Democratic and Republicans in Michigan glom onto supporting veterans as a political platform. It’s usually issue three of a three-point stump speech outline, because it is a feel-good topic. It’s not tax talk. It isn’t abortion. Yet, the Mitten remains one of the worst states for servicing veterans. In 2010, Veterans Affairs ranked Michigan last in federal funding received for its more than 680,000 veterans. The situation was bad enough Gov. Rick Snyder issued an executive order last year to create a new Michigan Veterans Affairs Agency to help connect vets with the benefits and medical services they earned. Creating a whole new agency certainly seems like a start, but here his another plan deserving to the support of all those lawmakers who pledge to support veterans. The Family Military Leave Act (House Bill 4777), introduced last spring by Rep. Theresa Abed, D-Mason, would give family members of a military member leave from their jobs when a their spouse is deployed to a war zone and home on leave. Twin legislation was recently introduced into the Senate by Sen. Jim Ananich, a Flint Democrat. It is good legislation that has seen little attention since it was introduced in May. Under the plan, employers with more than 15 workers would be legally bound to provide up to 20 days off for a military spouse with no pay. Benefits, like health care and vacation time, couldn’t be penalized and employers couldn’t fire someone for using the leave. Rep. Abed, a freshman in the House, says she introduced the legislation after a constituent in her district lost her job after taking time off to see her husband, who was being mobilized to war zone. In other cases, Abed points out, like the birth of one of her friend’s children, the service member simply isn’t able to get time off at all. “So, when they do get have time, it is so critical for them to be able to be with their families as a way to connect with families and deal with stress. It is the right thing to do,” she said. To date, the bill hasn’t moved since it was introduced and moved to the House Commerce Committee. One reason it hasn’t gained traction is because it was introduced by the minority party and has 13 Democrat co-sponsors, but no Republican support. Partisan politics shouldn’t be a factor. Republican President George W. Bush signed a similar federal law in 2008, called the new Family and Medical Leave Act for spouses, sons, daughters, step children and parents of a deployed military member to take up to 12 weeks in unpaid leave in a year for related events or to help with added issues like child care. The catch on the act was it only includes leave for National Guard and Reserve component families. By comparison, giving all Michigan military spouses a guaranteed 20 days leave from work seems like a small acknowledgement of the strain war puts on families. This legislation has sat on the shelf long enough. 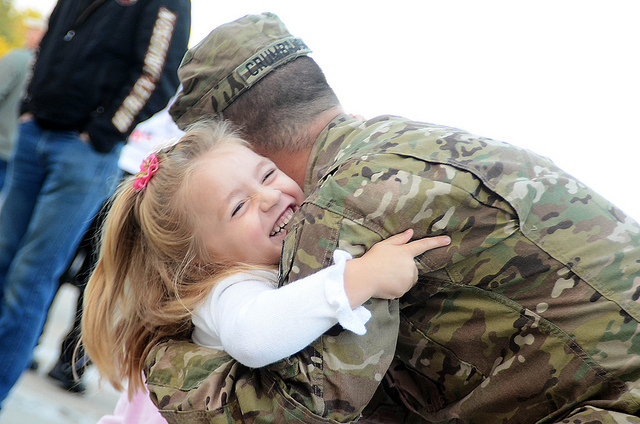 Michigan families are still making sacrifices for national security in Afghanistan and elsewhere. It seems only logical that lawmakers would go to work for them.